The prolactin test measures the prolactin blood level. This prolactin blood test, also known as a PRL test, helps assess whether prolactin levels are normal. The prolactin test, or PRL test, measures the prolactin blood level. Why is a prolactin blood test important? This PRL test is important for assessing fertility in both sexes and lactation in women. This Prolactin Test is a blood test. The prolactin test, also known as a prolactin blood test, prolactin lab test and a PRL test, measures the prolactin blood level. Prolactin is a hormone produced by a special gland in the brain known as the pituitary gland. Prolactin is is important for enlargement of the mammary glands during pregnancy and in milk production for lactation. Prolactin also is considered the principal hormone in sexual gratification. Abnormal prolactin levels are often responsible for infertility in both men and women and prolactin blood testing is typically performed as part of the workup for infertility. In men, abnormal prolactin levels can affect sperm production and testosterone levels which is why it is often ordered with the testosterone total test. In women, abnormal prolactin levels can prevent ovulation or lead to irregular menstrual cycles. Prolactin is also important in women during pregnancy as it helps prepare the breasts for milk production. During pregnancy itself, prolactin levels are somewhat muted as they are partially inhibited by estrogen and progesterone produced by the placenta. After a successful pregnancy, the placenta is no longer around to produce these inhibitory hormones and breast milk can be freely produced. In women who are having trouble producing breast milk after pregnancy, the prolactin level is often tested in conjunction with the estradiol test and progesterone test to see how the hormones are balanced relative to one another. In most cases, a high prolactin level, as opposed to a low prolactin level, is what causes problems. High prolactin test levels can be a consequence of a tumor in the pituitary gland known as a prolactinoma. Certain chronic medical conditions such as liver or kidney disease or thyroid issues can also cause abnormal prolactin test levels. Other things such as high stress levels and prescription medications can also push the prolactin blood test level out of range. To get a prolactin test near you at a Quest Diagnostics lab, order online and get your blood drawn at the lab you chose. Once the prolactin lab results are ready, you will be notified. As can be seen on the sample prolactin lab report above, the prolactin blood levels are reported as a number and can be compared against the reference ranges provided by the lab. 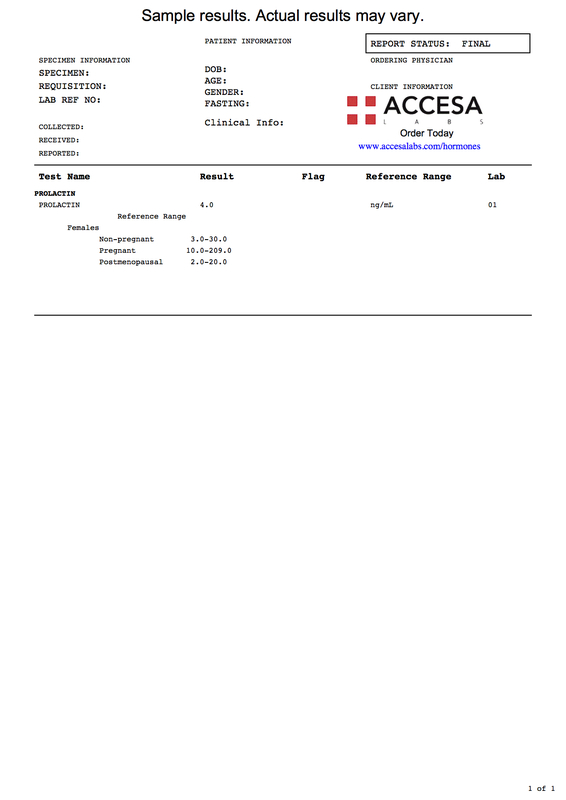 As can be seen on the sample prolactin lab results, prolactin blood levels are reported in ng/mL. Prolactin Test at Guaranteed Prices.